In recent years the requirement for multi-channel AEC has increased, especially with the rise of hands-free voice assistant devices. Voice assistant devices come with the capability for audio playback of not just the assistance’s response, but of music and television audio. In order to get the best audio quality for playback, 3.1 or 5.1 audio is used, and to help capture voice commands, microphone arrays are used. This transforms a simple single channel AEC structure shown in Figure 1, to the complex AEC structure shown in Figure 2. Figure 2 shows a 3.1 audio system with two microphones. This requires a total of 8 adaptive filters. As it can be observed in the figure, the convergence of the individual filters is dependent on the performance on the other filters. If one of the filters is ill-trained, it will result in large residual echoes, and this can lead the other filters to interpret they are missed trained as well. Therefore, a well designed stepsize control system for the adaptive filters is critical to insure proper convergence. For the best convergence performance, there must be an adaptive filter for each loudspeaker and microphone pair. However if you want to trade off computational complexity and memory resources for cancellation performance, there are other AEC configurations. 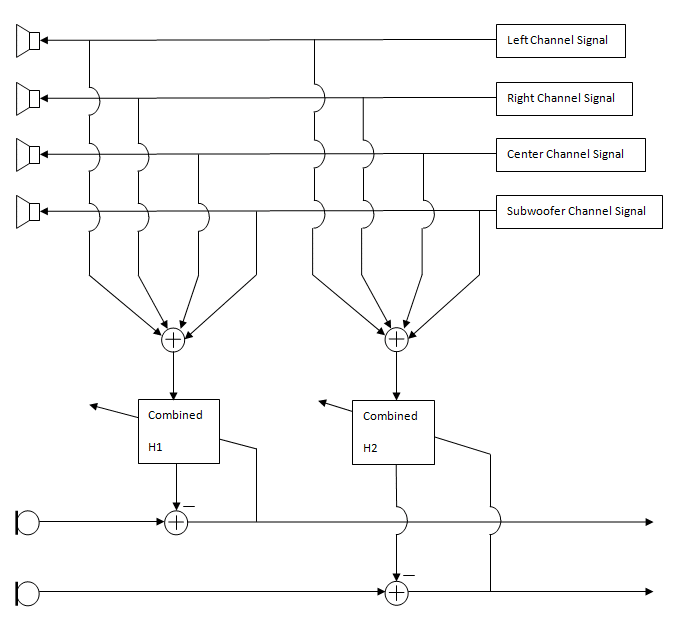 For example, Figure 3 shows an attempt to minimize the complexity of a multi-channel AEC solution. While this configuration will have a computational complexity 1/4th of the Figure 2 configuration, the echo return loss enhancement can be up to 6dB less. Another consideration is the domain in which AEC is performed. A subband AEC will perform better than its time domain counterpart. 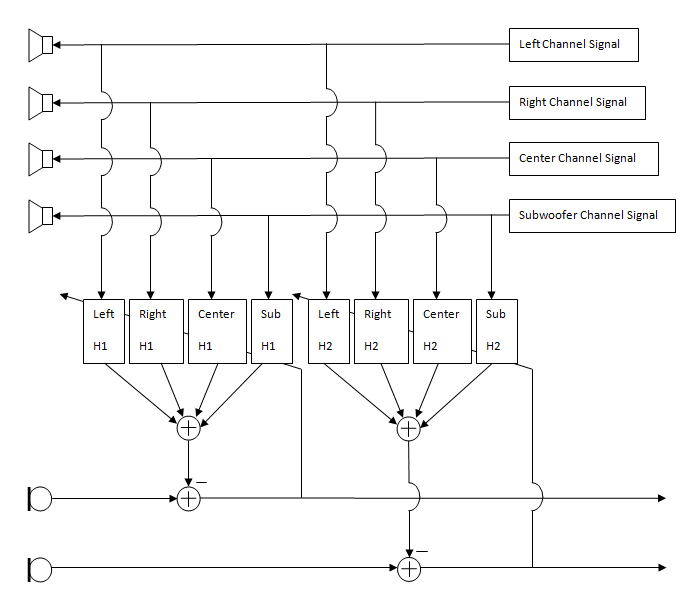 A subband AEC splits a fullband signal into multiple subbands. Each subband will have their own independent adaptive filters allowing for continuous training when the different loudspeaker signals have different dominate frequency components. This will improve the overall convergence speed of the AEC. VOCAL has a subband multi-channel AEC solution that can be applied to a variety of signal processing applications including voice assistant products. Contact us to learn more about our solutions.